Thank you for such a detailed, helpful post. I’m working on a Kickstarter project right now… hoping to launch it this fall and the advice you provide is priceless. Thanks! Hi Tom, Glad you found it useful. Please let me know if there is anything I can do to help. Good luck! I’m really glad you wrote this all up. As you know, I had a lot of feedback for you when you launched the project and I’m glad to see that you learned a lot and more importantly are sharing what you learned with the world so that others can do well with it. Kickstarter and all the other crowdsource funding services are amazing services that I’m a big fan of. Lately though it seems that more people are just throwing up their projects without fully thinking them out. C.C. your feedback was though to hear at the time, but I knew you made some good points. I agree that people seams to be putting projects up with out thinking them threw and that was part of my motivation for this post. As I learned there is a lot that goes into it and I hope people can learn from my mistakes. You, Nelson, continue to inspire me. Please never stop doing that. You’re very welcome. Hope it help! You are a true artist, not only you push the boundaries, but you also clearly communicate your experience of doing it. This is very insightful. Thanks for sharing you experience! Aras, Thank you so much for your comment. I’m really glad you liked it. 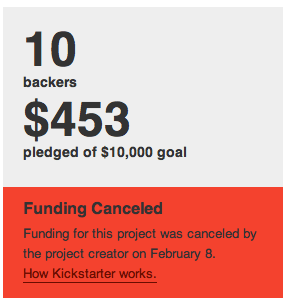 Next Next post: The misperception of crowd-sourced funding and the reality of Kickstarter.